If you can’t find your car keys, then we can help. At Access Denied we provide car key replacement in Waltham Abbey, as well as a number of other services. We’re able to replace car keys even if you don’t have the original, so don’t delay and get in touch today. With us you are guaranteed a quick, professional and friendly service. We’ll have you back in the car and back on the road in no time. Have you ever found yourself with a lost car key? Have you ever put your car key down and then wondered where it disappeared to? It happens to us all. However, sometimes car keys don’t turn up again and that’s when you need to face the fact that the key is lost and a replacement is needed. In order to get a new car key, you’ll need to contact a professional car locksmith such as Access Denied. 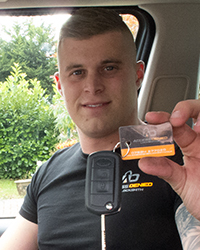 At Access Denied we offer car key replacement in Waltham Abbey and we’re always available to help. We understand that losing a car key can be a big stress, especially if you have places to be and things to do. That’s why we offer a 24 hour service, 7 days a week. Regardless of where you are or when you lose your key, you won’t have to wait long for a replacement. In fact, there’s no need to worry at all when you lose your key as one of our Access Denied team members can be with you within 30 mins. With our affordable rates and expertise, we’re confident that we provide an unmatched service. As keys have evolved over the years, so has the equipment that locksmiths use. We have almost everything needed to create a replacement key, for almost all types of vehicle, and we’re able to move this equipment around using our mobile setup. By offering a mobile service, we’re able to move our workstation to allow for replacement key cutting anywhere in Waltham Abbey. To avoid the stress and worry of you traveling to an auto locksmith, we travel directly to you. Nobody wants to return from a shopping trip or a busy day at work to find that they’re locked out of their car, but it’s a common problem. A large number of people find themselves locked out of their car and with no spare key, which puts a spanner in the works. Luckily, if you do need an auto locksmith in Waltham Abbey, then we’re on hand to help. As a qualified and experience team of auto locksmiths in Waltham Abbey, everyone at Access Denied is able to assist with whatever dilemma you are facing. Whether you’ve lost your key or you’ve locked the only key you have in the car, we’ll sort everything out quickly. Problems with a car key or car lock don’t always happen as a part of the standard 9am to 5pm working day, which means a lot of our calls come from people who are stuck at late at night or at the weekend. That is why we offer a 24 hour service, 7 days a week; this allows us to make sure we’re there whenever you need our help. After all, what’s the point in offering an auto locksmith service if our hours are limited and we’re not around to help when you need it most? Being locked out of your car is extremely stressful and it can have a negative impact on your day, which is why everyone at Access Denied focuses on convenience and solving the problem efficiently. We offer a range of auto locksmith services in Waltham Abbey including replacement car keys, car key reprogramming and car key repair. So, it’s safe to say we’re definitely able to tackle any problem that we’re faced with. Plus, thanks to our high quality equipment and large stockpile, we’re able to help with almost any car make and model. When you have a team of locksmiths on call, there’s no need to worry about what would happen if you were to lose your key. Though, to keep yourself extra protected and to avoid being locked out completely, it’s always good to have a spare key to hand. Before technological advancements saw cars become more secure than ever before, it was extremely easy to access a car. This meant that the issue of a lost key wasn’t a big deal and there was nothing wrong with locking your key inside the car. However, this is no longer the case. Though we’re thankfully that vehicles are now a lot safer when parked overnight, it does mean that gaining access to a car without a key requires the help of professionals. The impressive software that cars are equipped with makes it virtually impossible to access the car without a fully functional key, which is where the Access Denied team come in. Whether you’ve locked yourself out of your car or have lost the key altogether, it won’t take us long to solve the problem. We’ll either gain access to the car using our specialist equipment or we’ll cut a replacement key in a matter of minutes. At Access Denied, we always keep up to date with the latest locksmith equipment and machinery. This allows us to access any vehicle, regardless of make and model. During our time working as a car locksmith in Waltham Abbey, we’ve helped a large number of customers and we continue to do so. The highly skilled team at Access Denied work 24 hours a day, 7 days a week. This allows us to act as a car locksmith in Waltham Abbey at all times. So, we’re able to help when you need it most. We understand that you have no control over when you’ll need an auto locksmith, so we make sure we’re ready at all times. When you choose Access Denied, you are choosing a team that are able to come to you whenever you need us. Thanks to our mobile setup and mobile equipment, there’s no need for you to worry about how you’re going to transport the vehicle to us. Instead, we travel to you. All of our work is fully insured and we guarantee a professional service, so the process of needing an auto locksmith is always a smooth one. We’ve all been there; you can’t find your keys, you worry the keys are lost and you find your keys after five minutes of frantic searching. In fact, it happens to most people on a weekly basis. There’s just something about car keys that makes them extremely easy to lose, which is why they are one of the most commonly misplaced items for men and women alike. However, sometimes, the car keys really are missing and then there’s a bigger issue to solve. What do you do when you can’t find the keys and realise you’ve locked them in the car? It’s easy to think that the best way to solve the problem of keys locked in the car in Waltham Abbey is to try and gain access yourself. However, this rarely works out well. A great deal of training and experience is required to gain access to a vehicle without the key, and without this there’s a high chance you’ll cause damage to the lock or the car itself. Fortunately, at Access Denied we have helped a number of people who have found themselves locked out of their cars whilst their keys are locked in. Which, in short, means we’re pretty good at getting the job done. Locking car keys inside of a car is a huge inconvenience if you don’t have a spare readily available and it can really put a halt on your day. That is why we work hard to ensure we’re always available when you need assistance. As a 24 hours a day, 7 days a week, service we are always on hand to help when you find your keys locked in a car in Waltham Abbey. We understand that these situations are an emergency, especially if you’re in desperate need of access to the vehicle, and we work efficiently to ensure the problem is resolved as soon as possible. If you accidentally lock the keys inside you car and you don’t have a spare, contact us and we’ll be able to help in mere moments. In fact, we always aim to get to our call outs in less than 30 minutes.